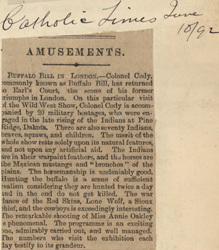 BUFFALO BILL IN LONDON.—Colonel Cody, commonly known as Buffalo Bill, has returned to Earl's Court, the scene of his former triumphs in London. 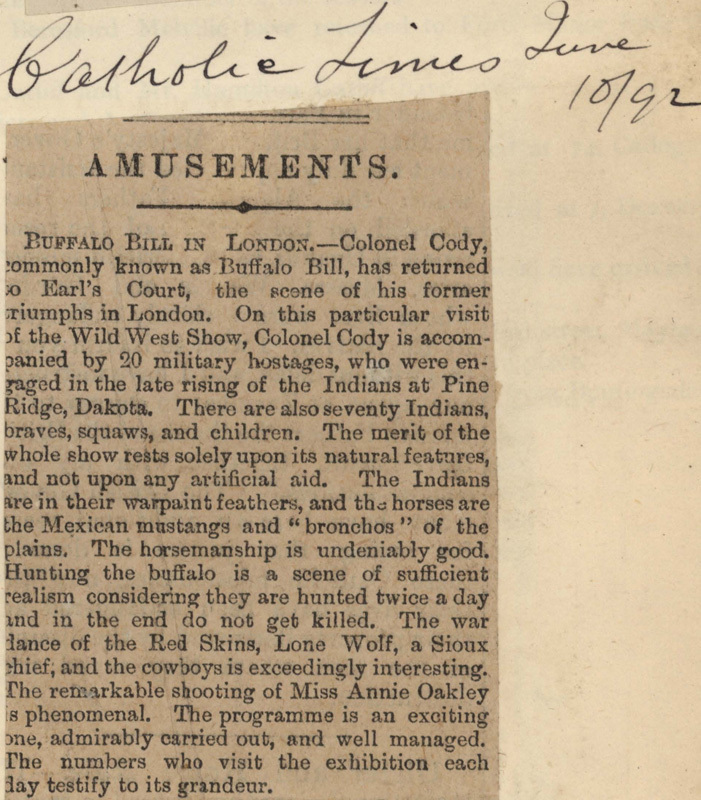 On this particular visit of the Wild West Show, Colonel Cody is accompanied by 20 military hostages, who were engaged in the late rising of the Indians at Pine Ridge, Dakota. There are also seventy Indians, braves, squaws, and children. The merit of the whole show rests solely upon its natural features, and not upon any artificial aid. The Indians are in their warpaint feathers, and the horses are the Mexican mustangs and "bronchos" of the plains. The horsemanship is undeniably good. Hunting the buffalo is a scene of sufficient realism considering they are hunted twice a day and in the end do not get killed. The war dance of the Red Skins, Lone Wolf, a Sioux chief, and the cowboys is exceedingly interesting. The remarkable shooting of Miss Annie Oakley is phenomenal. The programme is an exciting one, admirably carried out, and well managed. The numbers who visit the exhibition each day testify to its grandeur.